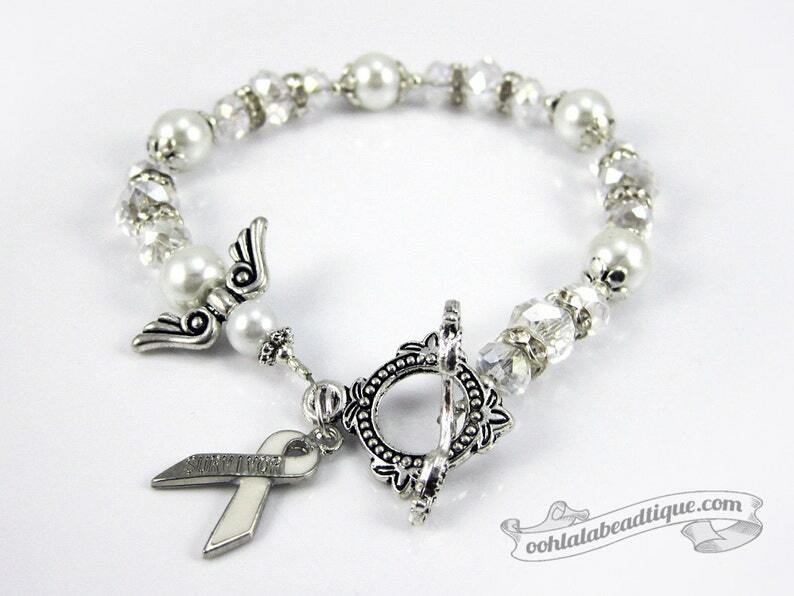 This cute white color Lung or Bone Cancer Guardian Angel bracelet is based on the Guardian Angel prayer, as a reminder of the presence of our constant heavenly companionship, and to provide hope and strength to its wearer. To light and guard, to rule and guide. Amen"
Clear Swarovski crystals, white glass pearls, and Tibet silver accents are combined together for a stylish look. The bracelet is strung onto tigers tail wire for strength, durability and drape. Finished off with an ornamental toggle clasp, and a white enamel survivor ribbon charm. 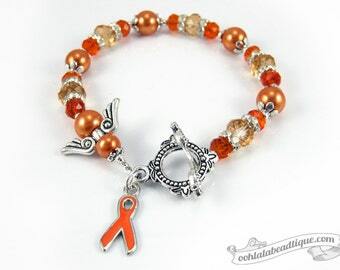 The Lung Cancer bracelet is approximately 8 inches (women's size medium) including the toggle clasp. The cancer awareness ribbon charm is 0.75 inches long. White Ribbon brings awareness to Lung and Bone Cancer. Support a friend or loved one with White Ribbon Bracelet. November is Lung Cancer awareness month. The ragged, rough grain of sand, transformed over time slowly growing into a object of great value and beauty. With it's humble beginnings, pearls symbolize innocence and a pure heart, and help us to get in touch with the simple honest things of life. They lift our spirits and make us feel calm and beautiful. Crystals have a long documented history of use in healing work in practically every culture and religious tradition since the dawn of time. Crystals have a similar vibrations as humans. Our bodies, like crystals, are composed of silicone and water, and we can respond to the vibration of crystals. This is why crystals worn on or close to the body are often used for healing or protective purposes. Crystals effect the entire body and energy field. Many Ooh-la-la Beadtique handmade products are crafted using natural components such as semiprecious stones, freshwater pearls, and wood. No two materials in nature are alike. The handmade Lung Cancer bracelet that you will receive may slightly vary in shade and texture pattern from the picture listing. Also note, that all monitors and computer screens are calibrated differently. The same product may appear in diverse colors on different monitors.